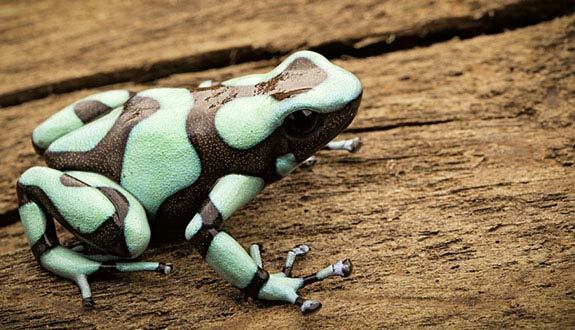 More and more popular, the Dendrobates auratus are easy to maintain and very beautiful. Assets that will not fail to seduce you! 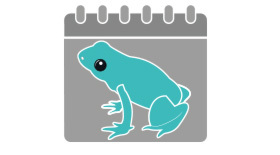 Find in this page all you need to know about these charming little frogs (only marketed species). 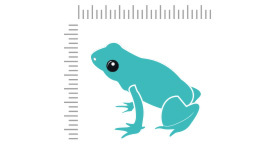 4 and more: 60 cm or 24"
Dendrobates are insectivorous. It will be imperative to offer them live prey supplemented with calcium. Drosophila, crickets (size: micro), collembolans will make up the majority of their diet. 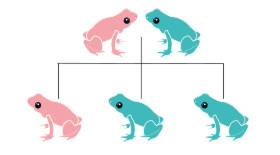 These frogs tend to obesity, feed them 1 day out of 2. The ideal is to have several prey in various parts of the paludarium to facilitate their feeding. 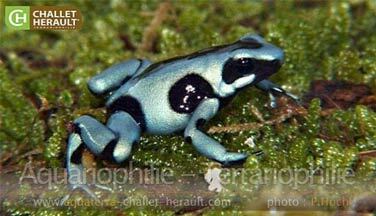 Dendrobates are diurnal animals. They may seem rather shy when they arrive in a new paludarium, spending a lot of time hidden. This behavior is quite normal and after some time of adaptation, they will eventually feel safe and they will show themselves much more. Who can live with the Dendrobate doré ? 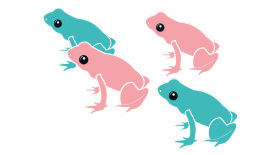 Frogs like to live in groups of several individuals of the same species. 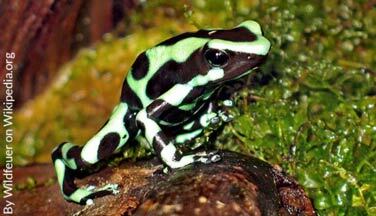 Indeed, it is prudent not to mix the different species of Dendrobates within the same paludarium. 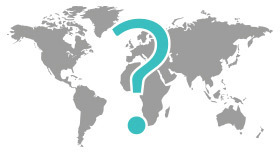 The risks of conflict are not to be neglected because they are rather territorial species, even if some have succeeded this cohabitation in some cases. As a precaution, we recommend choosing only one species per paludarium. 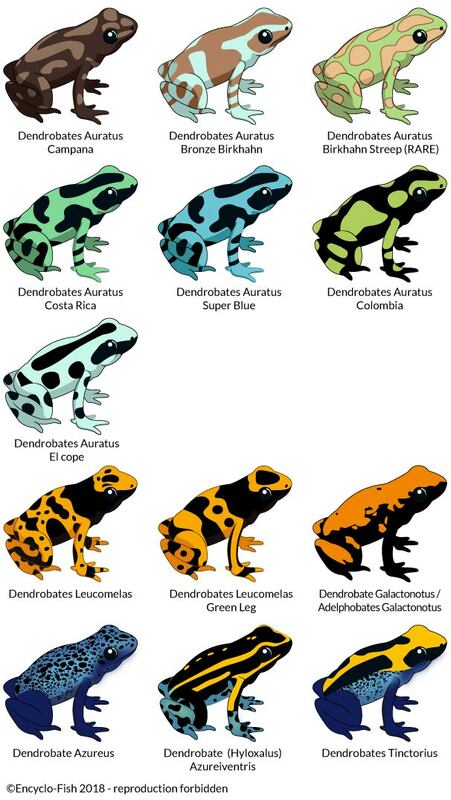 Dendrobates reach sexual maturity between 16 and 18 months. In order to seduce its female, the male utters a long and particular cry to reproduction. This parade can last from 2 to 3 hours. The female will lay its eggs on a damp support such as foam. Spawning may consist of 2 to 10 gelatinous eggs. Wait 48 hours before removing them. In order to raise the tadpoles, prepare a special water: mix mineral water, dried alder fruits and dried Catappa leaves. You will get an acidic and effective water against mold. Fill the bottom of small boxes or pots with this water and place the eggs taken from the paludarium. The temperature should be 23 to 25°C (73 to 77°F) inside the box. As the days go by, the little tadpole will form and then pierce its transparent envelope. Do not remove this envelope that will serve it excellent food! Once out of their envelopes, separate the tadpoles by placing them in different boxes: this will prevent that some get killed. You can feed them with spirulina or fish flakes finely crumbled. It is important to feed these young people in sufficient quantities and to renew their water regularly for good growth. Do not forget to change the water by the same mixture (mineral water + dried alder fruit and dried Catappa leaves). 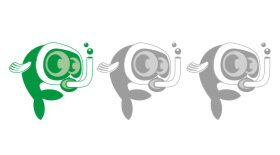 At the end of the development process, the four legs will begin to appear. It will then be necessary to lower the level of the water to allow the passage of tadpole to frog. The Paludarium will consist mainly of soil. We will therefore speak more readily of wet paludarium. Frogs should be offered only a small, shallow, submerged area (use a cup for example). 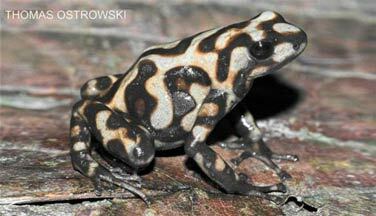 Indeed, the Dendrobates are not good swimmers: beware of drownings! Keep this water clean by renewing it every day if necessary. 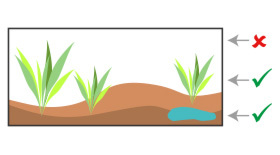 Install a substrate of coconut fiber or peat. Cover with a small layer of moss or sphagnum. If your paludarium is well planted, you can also add clay balls to the bottom of the paludarium. Vegetation side, the natural is mandatory! (No plastic plants). Epiphytic plants (orchids, bromeliads...), ferns, ficus and philodendrons will be ideal for a wet paludarium. For the rest of the decoration, plan at least one root or cork bark. These supports will be very popular with the Dendrobates because they will satisfy the semi-arboreal instinct of these frogs. Finally, create many hiding places for their well-being (hollow coconut for example). To maintain sufficient moisture in the paludarium, you can set up an automatic misting system. If your budget is limited, you can maintain this humidity yourself by spraying water twice a day. This solution, although more economical, is also quite restrictive, especially in case of absence. Aerate your paludarium well to avoid bacteria and mold. Lighting will be especially important for plants. A UVA neon or horticultural tube will allow a day/night cycle of 10 to 12 hours and good growth of plants. Finally, heat the paludarium with low power rugs or heating cables. 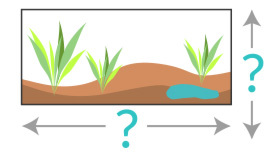 The spots are not appropriate because they will quickly dry out your ecosystem. Handle your frogs only when absolutely necessary. Wash your hands meticulously before and after each manipulation. 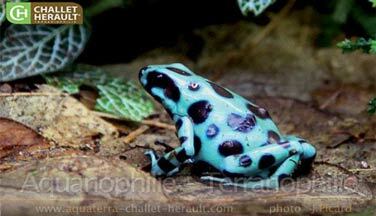 In their natural environment, Dendrobates have potentially dangerous toxins, due to their diet. 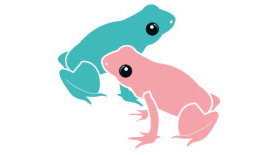 In captivity, these frogs completely lose these toxins and are therefore harmless.